Last week, Berkeley’s City Council unanimously passed a resolution that will drastically reduce the amount of disposable food ware from the city restaurants. Berkeley’s new Disposable Free Dining ordinance is a game-changing step forward in the global movement to stop plastic pollution from endangering waterways, wildlife, and communities. This ordinance is comprehensive: it requires that food vendors provide reusable food ware to customers who eat onsite, makes certain single-use disposable items available only by request or at a self-serve station, mandates a $0.25 consumer charge for any beverage sold in a disposable container, and bans food establishments from using any food ware containing toxic perfluorinated chemicals (PFAS). How best to engage a city’s business and residential community to develop an ordinance that is powerful, implementable, and likely to pass? 1. Give the business community an opportunity to provide input and voice concerns about the potential ordinance. We trained and oversaw 14 community volunteers who completed a survey of Berkeley food businesses to support the development of the ordinance. After surveying 10% of Berkeley’s restaurants, we found that businesses are concerned about the environmental impact and expense of disposable items. Despite these concerns, most Berkeley restaurants use single-use items because they are concerned that they don’t have the labor or dishwashing capacity to accommodate reusables. The ordinance addresses these concerns by providing small grants to help cover set-up costs and technical assistance to help businesses make the transition without increasing the cost of keeping their doors open. Our staff also participated in four of the seven public listening sessions that the city organized with the business and residential community to seek feedback on the policy. We also attended one-on-one meetings with the council member (and author of the ordinance) in which businesses expressed the unique concerns or challenges they wished to be considered in the final policy language. 2. Ensure that members of the business community have evidence of reusable-centric dining being successful and cost-saving. 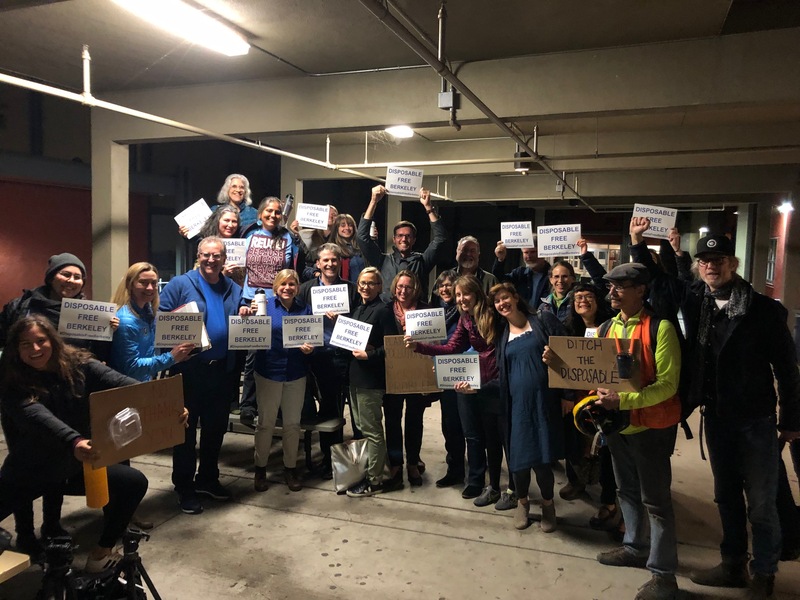 When this ordinance passed, we’d worked with six businesses in Berkeley and been active throughout Alameda County and the City of Berkeley helping businesses achieve ReThink Disposable certification since 2013. One of the reasons this ordinance was successful was that members of the business community had already experienced firsthand that it’s possible to transition to reusables while saving money, improving operational efficiency, protecting the environment, and maintaining or improving a customer’s dining experience. In Berkeley, we had a new business, Fourth Street Bagel, complete their certification last month. Despite not having a dishwasher, the owner, Han Tran, was able to seamlessly roll out a transition from disposable to reusable food ware for plates, coffee mugs, sauce cups, soda cups and stir spoons. In addition to creating a yearly net cost savings of $737, these changes will eliminate 32,633 pieces of packaging and 1,076 pounds of waste every year. 3. Make the business community aware that the ordinance is something consumers want and support. Our ReThink Disposable team encourages community members to support ReThink Disposable certified businesses and let them know that they appreciate the business’ choice to become certified. 4. Educate the legislative body (often a city council) voting on the ordinance about why the business community supports the ordinance. The ReThink Disposable team’s extensive experience transitioning businesses to reusables empowered them to testify at a press conference in April, 2018 and a city council hearing in January, 2019 about the positive long-term benefits for businesses, communities, and customers of shifting to a culture of reuse and moving away from polluting and unsustainable disposables. Two of our business participants, Flo’s Friendly Foods and Caravaggio, came out publicly in support of the ordinance and made themselves available to answer questions from council or the media. 5. Make sure that the legislative body knows that the residential community supports the ordinance and wants to end the throw-away lifestyle that generates waste and pollutes our waterways. The ReThink Disposable team joined forces with Clean Water Action California’s phone and field canvasses to activate over 4,000 Clean Water Action members in Berkeley. In addition to collecting support letters and emails to the Mayor and City Council, our canvassers encouraged members to attend council hearings on the ordinance.